VWSA have announced the winner of its Ntinga Project, following a full day of presentations by participants. Five winning suppliers were awarded their supply contracts, which will come in to effect once they complete a 18-month training and mentorship programme successfully. 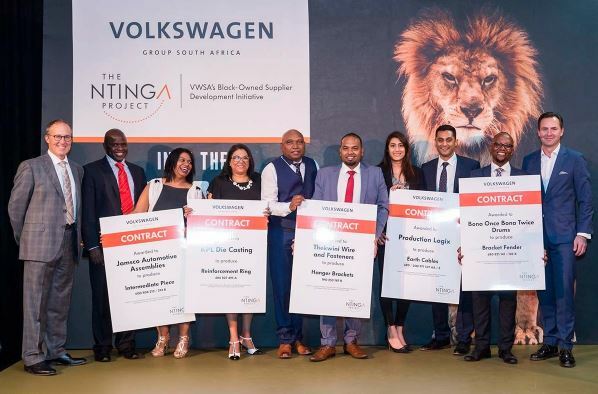 The Ntinga Project was launched on 19 October with the announcement of the 10 finalists, and was followed by intensive mentoring to each finalist by an existing and established VWSA supplier. The five winners in no particular order are: Bona Once Bona Twice CC, Jamsco Automotive Assemblies (Pty)Ltd, KPL Die Casting (Pty) Ltd, Production Logix (Pty) Ltd and Thekwini Wire and Fasteners (pty) Ltd.
“The caliber of presentations today showed us that there is a lot of potential in the market, all these suppliers need is guidance, training and a helping hand,” said Thomas Schaefer, VWSA Chairman and Managing Director. The five winners now start an intensive 18-month mentoring programme run by VWSA Learning Academy, VWSA B-BBEE Trust, ASCCI (Automotive Supply Chain Competitiveness Initiative) and other VWSA divisions to ensure that they receive a wide range of skills that will make them successful at the end of the 18 month mentorship journey. “Volkswagen is committed to developing and supporting these five up and coming black-owned suppliers. We have the resources, skills and know how in-house and together with our partners we can ensure that they will succeed. It’s only five, but it’s a start and we aim to continue to develop B-BBEE suppliers in the Automotive Sector.” said Thomas Schaefer, VWSA Chairman and Managing Director.